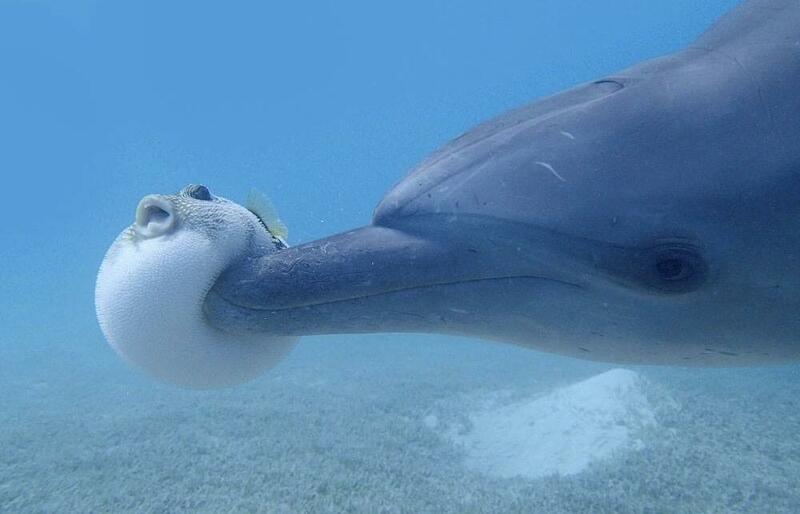 Dolphins have been observed in the wild getting “high” on the toxins produced by pufferfish. The stunning footage, filmed for the BBC, captured a group of young dolphins very carefully provoking a pufferfish, also known as a blowfish, so that it would produce its dangerous toxin, which can kill if taken in large doses, but induces a pleasant narcotic effect on the dolphins in smaller doses. What’s clever is that the dolphins appear to have worked out how to produce just the right amount of the drug to get “high”. They grab the pufferfish by their teeth and play with it until it spurts out its poison. After ingesting the drug, the dolphins then appear to be in a blissed out state, rolling on their backs with their eyes closed. Despite some experts pouring scorn on the claims, zoologist, Rob Pilley, who worked as a producer on the BBC series, Dolphins: Spy in the Pod, insists this was deliberate behavior by the dolphins. This example of strange animal behaviour was caught on camera by the documentary makers, in the sea off the coast of South West Africa, by using a camera disguised as a fake turtle. The toxin the puffer fish produce is Tetrodotoxin. which in small doses is known to induce a tingly feeling and numbness. But in larger doses is lethal. One puffer fish can produce enough of the toxin to kill 30 adults. Despite this the puffer fish is considered a delicacy in Japan. Not surprisingly chefs are specially trained in the art of prepating it.